Today I did a colonoscopy and an endoscopy procedure. Nothing serious occurred but I just wanted to post a quick note partly for the benefit of any of my friends who have never done a colonoscopy before, and partly for my own reflection. A colonoscopy is a procedure that checks your large bowel by inserting a tube down there. A general rule seems to be that if you get regular bleeding down there when you go to the toilet, for say 6 months, then you should do a colonoscopy. Another general rule is to get a colonoscopy once you hit 50. Yet another general rule appears to be that you should not do a colonoscopy more than once in a less-than-five-year period. I also did an endoscopy to check my oesophagus - to see if there were any problems associated with heartburn or reflux. As far as I can tell the procedures went well thanks to the nurses and doctors, subject to the biopsy results. for two days prior to the colonoscopy procedure. Some of the recommended foods were hot chips, mash potato, white bread, ice cream and fish. Which was certainly doable! In my case interchanging between the clear soup, jelly and sports drinks was a lifesaver - it provided me with savoury and sweet options! Moviprep deserves a heading of its own because this is what creates the chaos. The best way I can put this (as someone said to me) is that it is a liquid that causes you to 'cleanse your bowels'. In other words, there is no nice way to say this --- Moviprep causes you to diarrhoea very badly LOL. Stomach cramping seems to be common too. 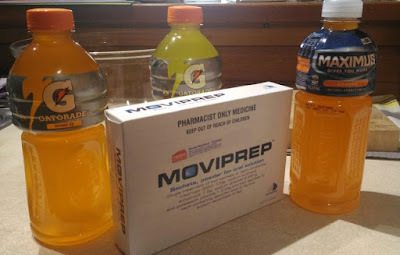 At 4pm the day before the procedure, I had to drink 1L of Moviprep, interspersed with 500ml of clear fluid over the next hour or so. At 8pm I had to drink ANOTHER 1L of Moviprep over the next hour or so. Starting from midnight of the day of the procedure, I was not allowed any solid food or liquids. Prior to doing this procedure, I had read a forum on the topic. The procedure is not as bad as some people exaggerate ("IT WAS THE WORST DAY OF MY LIFE"), but it is not easy either. For starters, although Moviprep is 'lemon-flavoured', no amount of lemon scent can actually mask the liquid's true intent. The taste gradually becomes foul after the first few gulps, particularly during the second 8pm dosage (when you are already quite full of liquid). I had two real battle points during this procedure. The 4pm dose was fine. However the first real testing point was the 8pm dose. At that point I was already full of liquid (from the 4pm dose plus my clear liquids for 'dinner'), and had to put in more liquid at 8pm. I almost felt like vomiting due to the horrible taste, but eventually spread out the 1L over the next 1 hour. Yellow Gatorade was my saviour. You have to finish each dosage as prescribed. As Harry Potter said to Dumbledore: "You've got to keep drinking, remember? You told me you had to keep drinking." The second testing point is the period from midnight of the day of the procedure to the time of the procedure itself (about 11am for me). b) You may get hungry during this time, which is rather dangerous. I woke up at 4am and at this point I was praying that I would not get hungry because that would be an awkward time to get hungry (my stomach was rumbling). However, thankfully I was able to have disturbed sleep for the next few hours and I shook it off. Drank 2 cups of water at about 11.50pm before going to sleep. However quite honestly, I was too tired to do that and had slept by 11.30pm. I was still rather full of liquid. Spread out my consumption of clear liquids in between 4pm to 8pm so that I would not be too full for the 8pm Moviprep dosage. It was also the first time I was put to sleep for a medical procedure. I can only remember him saying that there would be a cold shiver down my arm, and the next thing I remember was the nurse waking me up. I did not know what was going on when I woke up and I felt rather dazed!! It was such a strange sensation. I almost forgot who I was or what I was doing there. I had to lie down for it to wear off. And that makes me wonder...this might be a distasteful subject but...that moment when one blacks out before surgery --- is that what it is like when someone passes away peacefully? They just suddenly fade out without realising it? All I can say is that I'm glad that I can eat again and I would rather NOT do that again LOL. I now have a tiny understanding of what it is like to undergo a medical procedure - doing a serious operation must be a 1,000,000,000,000 times worse because there is the added element of pain during rehabilitation and recovery etc. What I experienced these last two days is absolutely nothing compared to what others have faced. I'd like to thank my mum's friend for dropping me off and my granduncle for picking me up - you are not allowed to drive after the procedure.